Just weeks after kicking the decision on the controversial Keystone oil sands pipeline until after the 2012 election, Congress forces action in 60 days. NEW YORK (CNNMoney) -- Now that a congressional tax deal has been reached President Obama has one more tough call to make. He has 60 days to either approve or reject the controversial Keystone oil sands pipeline expansion project which has dogged his administration. While that sounds fairly straight forward, like much in Washington it's not. Thursday's move by Congress is a Republican attempt to force the president's hand before the election. He either has to approve the pipeline and alienate his environmental base, or reject it and explain to voters why the nation doesn't need 700,000 barrels a day of Canadian crude. But there are a number of options on the table, and not all of them require yes or no decisions. Approve the project: This is clearly what the Republicans, the pipeline's builder TransCanada (TRP), and the oil industry want. They say the $7 billion pipeline will create over 10,000 jobs in each of the two years it takes to build, generate $5 billion in property tax revenue and pump a total of $20 billion into the U.S. economy over the project's 100 year lifetime. Crucially, they say that while the 700,000 barrels of oil a day the pipeline would carry is still imported oil, at least it's from politically stable Canada. "The president can immediately put thousands of Americans to work by approving this pipeline," American Petroleum Institute President Jack Gerard said in a statement Thursday. "And it will contribute to our national security, economic growth and energy security." Reject the project: This is what environmentalists want and they cite a list of reasons why the pipeline should be turned down. They say the jobs numbers are bunk, pointing to studies form the State Department that predict 6,000 jobs and one from Cornell saying it will actually cost jobs as it will stifle the green economy. They say the pipeline could leak, or that the crude from Canada would be exported to Europe or China. But mostly they are concerned over the environmental effects of developing the oil sands themselves. Much of the oil sands are mined like coal in giant open pits that result in water pollution and deforestation. Companies that operate in the oil sands, including ExxonMobil (XOM, Fortune 500), BP (BP) and Royal Dutch Shell (RDSA), have gotten better at mitigating these impacts, but problems remain. And because oil sands are just that -- sand mixed with oil -- the oil needs to be separated out, requiring massive amounts of energy and leaving an overall greenhouse gas footprint 5% to 30% greater than conventional oil. "I am confident that President Obama will stand up to big oil and reject this dangerous and unnecessary pipeline," the National Wildlife Federation's Jeremy Symons wrote in a blog post Thursday. A third way: Fortunately for Obama there seems to be some wiggle room here. 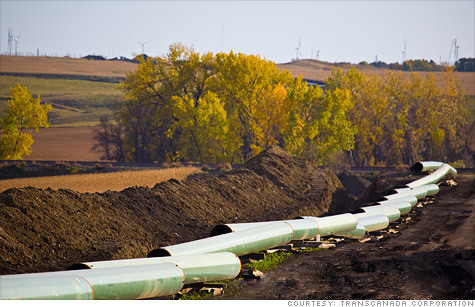 It's possible Obama could reject the pipeline in 60 days, citing lack of time, but invite TransCanada to resubmit their application, putting the process back on the one-year time track where a decision could be conveniently rendered post-election. "This wouldn't cheer staunch environmentalists," Christine Tezak, an energy and environmental policy analyst at asset management firm Robert W. Baird & Co., wrote in a research note earlier this week. "But such action could yet put the approval back on the White House's preferred timeline to finalize the project in early 2013." Obama could also issue an approval, conditional upon a new environmental review in Nebraska, which would buy more time. Either way, the administration now has a decision on its hands that it did not want to make before 2013. "We expect a heavy amount of lobbying between now and the end of the 60-day timeframe," Whitney Stanco, an energy analyst at the Washington Research Group, wrote in a recent research note. "Much will depend on the forcefulness of the campaigns for and against the project and how the president's re-election team predicts a decision will impact the election."